Kuwait’s Minister of Commerce and Industry Khalid Al-Roudhan affirmed yesterday that the business environment in his country continues to improve toward becoming an attractive destination for foreign investments. Roudhan made his remarks on the sidelines of taking part in a joint dialogue symposium with his Iraqi counterpart Mohammed Al-Ani and a number of Kuwaiti state officials and prominent Iraqi businessmen Wednesday night. The recent amendments and changes in Kuwaiti laws, particularly investment, made direct investment easier and more attractive for foreign merchants to increase their business ventures in the country, he said. He affirmed his ministry’s aspiration to establish a number of new laws aimed to boost efforts toward transforming Kuwait into major financial and commercial hub in the region. Meanwhile, the event highlighted significant key features of the Kuwaiti investment encouragement law, as well as business opportunities available for foreign investors inside Kuwait. The Kuwaiti officials affirmed their government has succeeded in improving the business environment in the country by recently attracting more foreign capitals, adding such a significant effort is part of Kuwait’s 2035 vision. They also said the Kuwaiti market is currently more promising and enjoys a higher purchasing power, adding it has also become a center of attention for foreign companies. Moreover, the Kuwaiti-Iraqi sides reviewed some the obstacles facing the growth of business between them, and ways to overcome those obstacles and increase investment opportunities in both markets. They also discussed ways to enhance border ports between the two countries, and ways to accommodate any future development of business exchange between them. Top Iraqi and Kuwaiti trade officials yesterday held a second round of discussions on boosting commercial cooperation between the two neighboring countries. 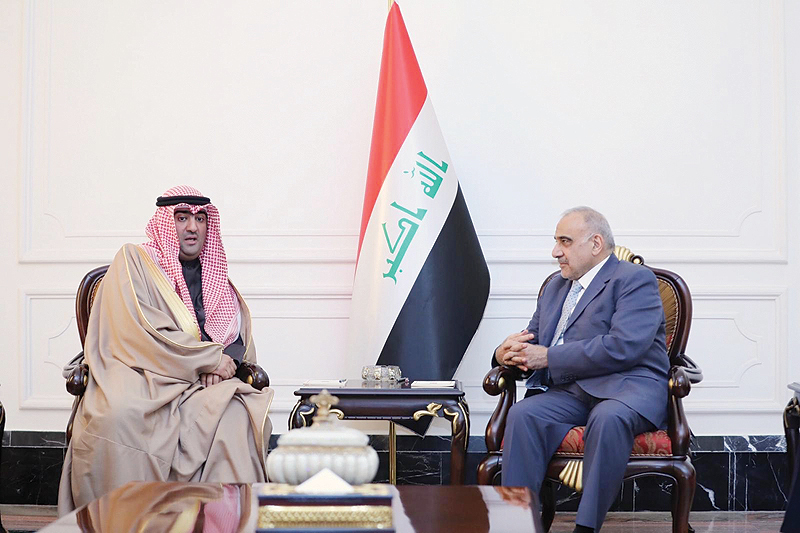 Earlier, Iraqi Prime Minister Adel Abdul- Mahdi hailed the special bonds and the huge prospects for economic cooperation between Iraq and Kuwait. In statements during his reception of Roudhan, Abdul-Mahdi described Iraqi- Kuwaiti relations as special. They are overwhelmed by cooperation, good intentions and mutual desire to develop them in all domains to serve stability, development and economic prosperity, he pointed out. The Iraqi premier said his country was moving steadily towards overcoming hardships of the past and removing repercussions of the devastating war. Iraq now was focusing on rebuilding through cooperation with brothers and establishment of economic and trade partnerships to materialize the interests of Iraqi people and other peoples of the whole region, he clarified. He expressed readiness to buttress cooperation with Kuwait and reinvigorate work at the border posts and offer all facilities for investors.